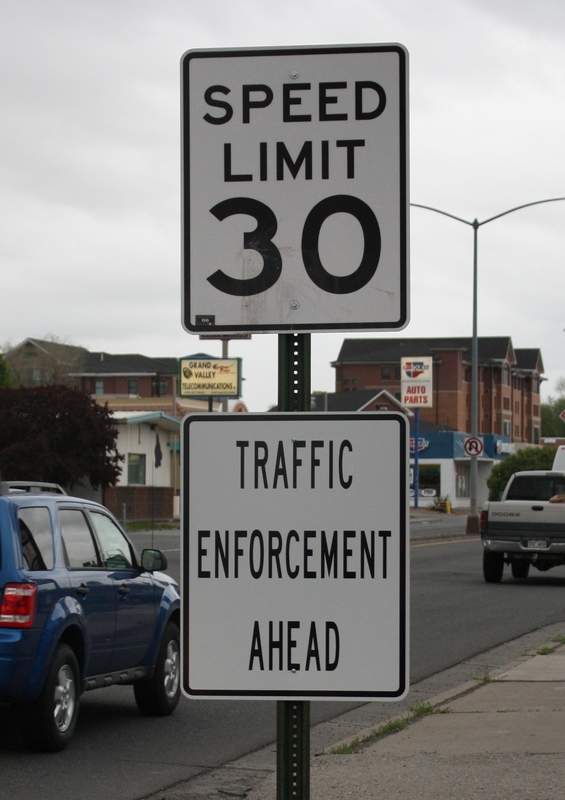 Grand Junction drivers will notice something new along two heavily traveled roads: signs warning of “Traffic Enforcement Ahead.” The new signs are part of a concentrated effort targeting locations where we see the highest number of crashes in the City, and are posted currently along Patterson Rd. from 7th St. to 28 ¼ Rd. and North Ave. from 1st St. to 12th St. In addition to the signs, expect increased traffic enforcement at three intersections that also see frequent crashes: 28 Rd. and North Ave., 4th St. and Ute Ave., and 5th St. and Pitkin Ave.
Officers will be on the lookout for a list of traffic violations, including speeding, red light running, following too closely, turning left in front of oncoming traffic, and unsafe lane changes. Over the last couple of years the Traffic Unit has increased its targeted enforcement in areas that experience large amounts of crashes, as well as in areas where we hear complaints from the public. As a result, we saw 268 fewer accidents in 2010 compared to 2009. That equates to a nearly 11% decline in the number of crashes in the City.